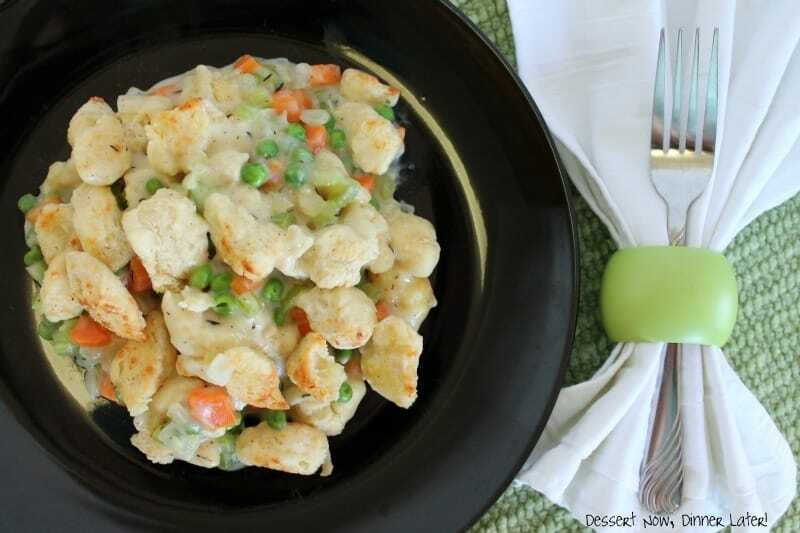 Chicken Pot Pie Crumble - Dessert Now, Dinner Later! I have decided I want to make sure I have some of the good old home cooking/comfort food type recipes on here. 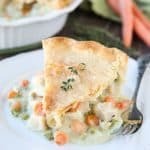 So here is a classic chicken pot pie, made easy! Easy as in no rolling out pie crust, just make a biscuit type crumble for the topping. It still has some time consuming parts, but it is worth it! 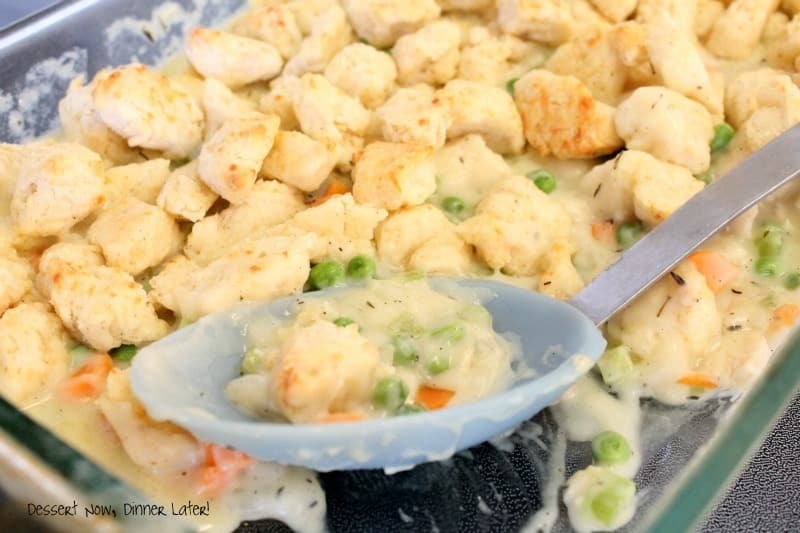 The topping has all the texture & flavor of a crust, but in large crunchy chunks on top. 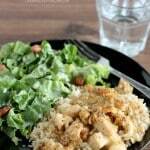 The filling is flavorful & creamy! YUM! And even though my toddler distracted me & I totally forgot milk in the sauce & baking powder in the topping, it was still fantastic! But for your sakes I will post the original recipe so you can make it right, but hey even though I had a rough time making a new recipe with distractions of, “Mommy, where are my boots? Are they in my room? Are they in your room? 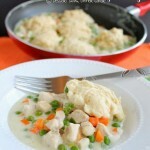 Mommy where are they?” the whole time I was cooking, we still enjoyed this classic savory dish! It is definitely on my make again list! 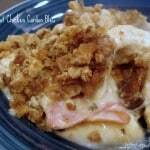 *Update 03/30/13: We make this regularly now & we just absolutely love it! One of our family favorites, so I updated the photos. Simmer chicken in broth in a large pot; cook till just done, about 10-12 minutes. (If you plan in advance you can slow cook in the crockpot on high for 3 hours or low for 5 hours.) Transfer chicken to a medium bowl. Pour broth through fine-mesh strainer into a liquid measuring cup & reserve. Save empty pot for later. Stir in Parmesan cheese. Add the cream (or milk) & stir until just combined. Crumble the mixture into irregularly shaped pieces onto a baking sheet lined with parchment/wax paper (I actually find it easiest to use scissors & cut off chunks.) Bake the crumble topping until fragrant & starting to brown, about 15 minutes, tossing halfway through. Set aside. For the filling, heat the olive oil in the now-empty pot over medium heat. Add onion, carrots, celery, a little salt & pepper. Cover & cook, stirring occasionally, until just tender, about 5 minutes. 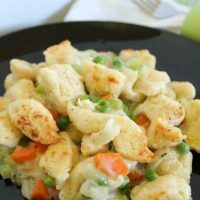 While the vegetables are cooking, shred/cube the chicken into small bite-size pieces. Transfer the cooked vegetables to the bowl with the chicken; set aside. Over medium heat melt butter in the empty pot. Stir in the flour & cook for one minute, stirring constantly. Slowly whisk in the reserved chicken broth & milk. Bring to a simmer & stir occasionally until the sauce thickens, about 5 minutes, taking care not to burn the bottom. Add ½ tsp salt & ½ tsp pepper. 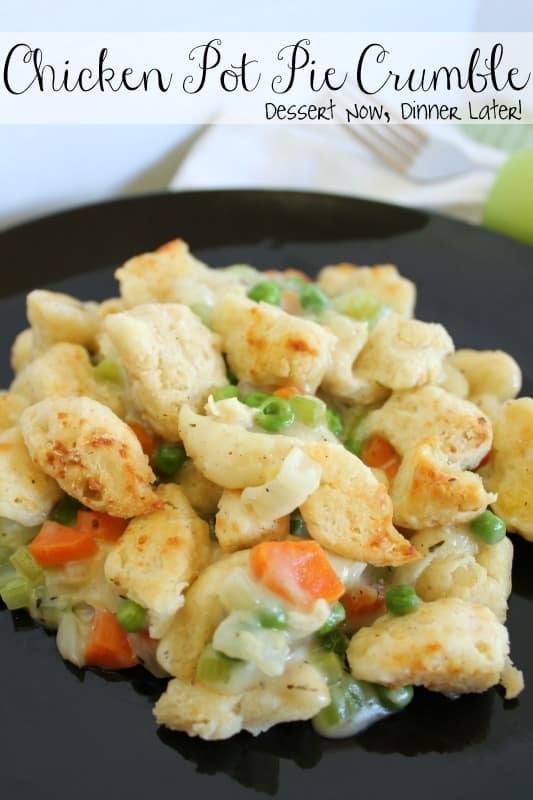 Remove from the heat & stir in the chicken, vegetables, & peas into the sauce. Pour the mixture into a greased 9x13 pan. Scatter the crumble topping evenly over the filling. Bake at 400*F until the topping is well browned, & filling is bubbling, about 15-20 minutes. Let the casserole stand for 10 minutes before serving. LOOKS AWESOME !!! Can’t WAIT to try !!! If I made it ahead and will reheat any idea how long it will need to be reheated. I didn’t put the topping on yet. Thank you. I decided to Reheat it in individual portions in the oven. (Only needed two) Took between 30 and 40 min. Warmed it to almost 165 and then added the topping back on for the last 10 min. It was good but thinned out a bit more than I would have liked. I plan to eat it one more time and than freeze the left overs. Yes i agree-That’s why I deided to only reheated what we were going to eat tonight. So it’s been cooked once and will be reheated once. Thank you. Btw husband loved it. This is definitely one of our favorite meals! So glad you liked it! 2nd time making this tonight. I always have to double it. The first time it was SO GOOD. I can’t wait until it comes out this time. One of our favorites. It takes me forever to make it though because I am not very organized. Thanks for a great recipe!! This is SERIOUSLY one of our favorites! It is total cold weather comfort food! We make it frequently at our house! Glad you enjoyed it also Jennifer!